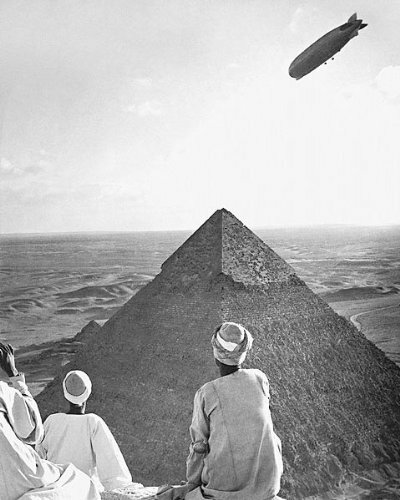 When Worlds Collide: The Graf Zeppelin cruises over the great pyramids at Giza, 1931. ONCE WE WERE ABLE TO CAPTURE LIGHT IN A BOX, in the earliest days of photography, there seemed to be a worldwide obsession with recording things before they could vanish. Painters might linger in a wistful sunset over a craggy shoreline, and certainly that was part of the photographer’s prerogative as well, but, immediately following the introduction of the first semi-portable cameras, there was a concurrent surge in the recording of the ancient world…temples, churches, monuments, pyramids, waterfalls, Africa, Asia, empires new and old. The nineteenth century saw an explosion in the number of world tours available to at least the wealthy, as seen in The Innocents Abroad, Mark Twain’s chronicling of a global excursion of Americans to the venerable ports of the old world. Cartes-de-visites (later post cards), stereoscopic views and leather-bound books of armchair photo anthologies sold in the millions, and the first great urban photographers like Eugene Atget began to “preserve” the vanishing elements of their world, from Paris to Athens, for posterity and, quite often, for profit. This first-generation fever among shooters carried forth through two World Wars, the Great Depression, and into the journalistic coverage of revolutions and disasters seen in the present day. The photographer is aware that this is all going away, and that bearing witness to its disappearance is important. We can’t help but realize that the commonplace is on its way to becoming the rare, and eventually the extinct. We can’t know what things we regard as banal will eventually assume the importance of the contents of the pharaoh’s tombs. Ramses’ everyday toilet items become our priceless treasures. Now, however, instead of sealing up pieces of the world in pyramids, we imprison the light patterns of it, with history alone to judge its value. Making pictures is taking measure of our world. It is our voice preserved for another time. This is what we looked like. This is what we thought was important. This shows the distance of our journey. New worlds are always crowding out old ones. Photography slows that process so we can see where one curtain comes down and another rises. This entry was posted on September 23, 2015 by Michael Perkins. It was filed under Essay, History, Photo-journalism and was tagged with 19th century photography, culture, documentary, history, photojournalism.